In December 2016, President Obama signed into law the 21st Century Cures Act. 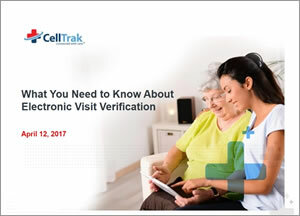 Although the act itself covers a variety of topics, it notably requires states to implement electronic visit verifcation (EVV) for Medicaid personal care services and home health care services. Understanding the different EVV options available – and choosing the right one for you – offers many benefits to agencies and home health providers including improved operating efficiency, caregiver communication, quality of care, and client satisfaction. What is EVV, and what are the different options? Darby Anderson serves as the Executive Vice President and Chief Development Officer of Addus HomeCare Corporation. Mr. Anderson is in his 20th year operating and developing personal care buisness for Addus, which operates in 24 states through 114 locations and serves over 34,000 customers. He has over 25 years of experience in operations and business development of home care and home health services. Mr. Anderson has also been appointed or elected to board and advisory committee positions in multiple states, and he’s currently serving as Vice Chairman of the Medicaid Parternship for Home-Based Care.